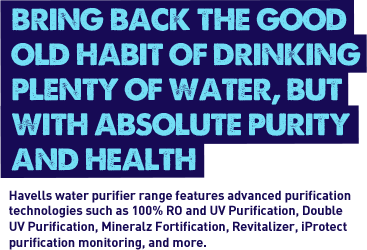 Absolute safe drinking water with 100% RO and UV purification. Absolute safety through 100% RO and UV Purification Havells offer 100% RO & UV with 8 stage purification - 1- Membrane performance enhancer,2- Sediment cartridge, 3- Activated carbon cartridge, 4- Reverse osmosis membrane, 5- Mineralz cartridge,6- Silver impregnated taste enhancer,7-Revitalizer,8-Germicidal UV. Revitalizer It restructures the water molecules and makes them biologically active to improve the hydration and mineral absorption. Mineralz Mineralz cartridge will have maximum representation of essential minerals like calcium, magnesium, potassium & Trace elements like Iron, copper, iodine, zinc, manganese etc.& many more. Germicidal wave length Disinfects microorganisms like bacteria, virus, protozoa; disinfects the water for safe drinking. i-Protect purification monitoring – safe water or no water! In case of UV failure the indicator blinks. Product stops purifying and filling water to ensure that every drop of purified water is disinfected & safe for drinking at all times. 1-In-A-Million Service At Havells we pride ourselves in offering exemplary products to our consumers and when it comes to our installation and post-sales service, it’s not so different either.